Now, I actually turned out to like the latest issue of this series but having let it marinate for a month, I have come to the conclusion that it isn’t as good as I previously thought. 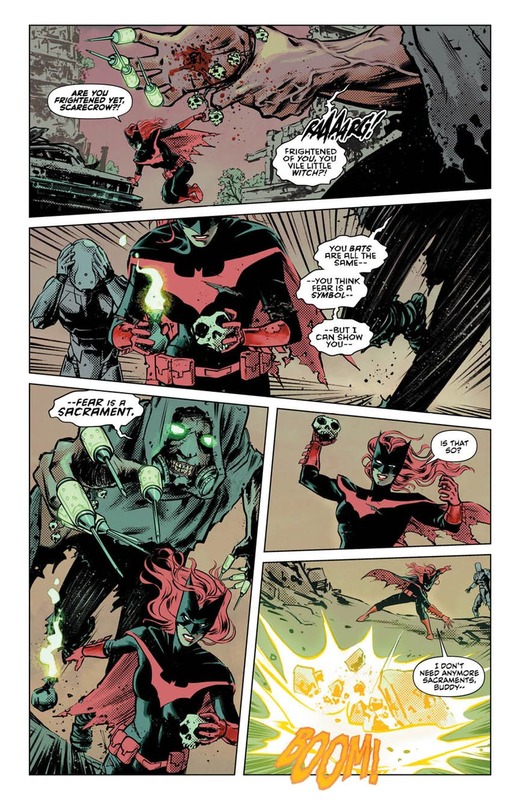 Granted, I think it is still one of the better issues of this Batwoman series so far but that’s not exactly saying much. It doesn’t help that we’ve been stuck in this god forsaken Many Arms of Death storyline for nearly a year now. It honestly seems like we’ve doubled down on this story and that makes me very worried for the future of this book. I can’t imagine getting excited by any story involving the Many Arms of Death and while I’m entertained by Scarecrow being in this series, I am ultimately left unsatisfied. However, the series could always throw me a curveball and I’ll end up liking this issue too. Let’s just jump in and find out. Our issue begins with the woman Fatima, whom we saw in the previous issue, reporting to the twins at the head of the Many Arms of Death. She is describing the work that Dr. Crane is doing with his latest batch of drugs and the twins seem to be very pleased with the progress. 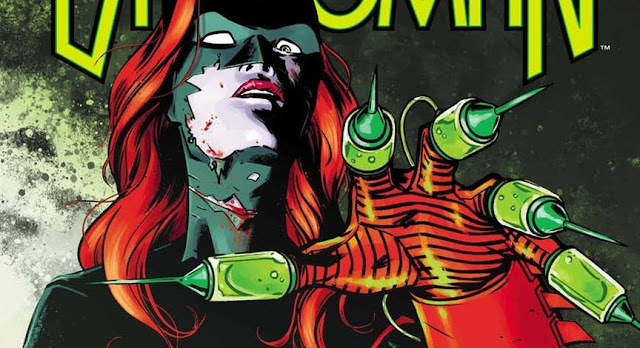 They seem pleased that there are so many psychedelics in the new toxin and Fatima then makes some comment about how the Many Arms of Death are going to show Batwoman who she really is. Meanwhile, in the fear sequence Batwoman and Colony Prime are facing off against a giant version of Scarecrow and Kate is seeing things like her father’s floating head. The two need to retrieve Colony Prime’s helmet back and Kate throws a pot at Scarecrow to knock it free. The two begin to flee from Scarecrow and to cover their tracks, Kate grabs a skull bomb of some sort and hurls it at Scarecrows feet. Scarecrow seems to completely ignore it and instead allows the two a moment to flee instead of following them. After their escape Kate and Colony Prime go right back to their weird father issues discussion that they had in the previous issue. While they do so, Kate begins grabbing things from the environment to find a means of escape. The two continue their argument for what seems like an eternity before Kate finally makes progress. She was able to find where a power outlet actually was in the real world. Apparently she was able to do it by the gold in her brain that she got from Rafael on Coryana. The two hook Colony Prime’s helmet up to the wires and are finally able to get a distress beacon out to Julia and the Colony. After doing so though, the area seems to explode with more fear toxin and we see the giant Scarecrow return. This latest dose seems to hit Colony Prime pretty hard as he leans into his hallucination fully as he sees his daughter has grown up to become a soldier just like him. Prime is knocked down by the woman Fatima and Kate finds the picture of him with his daughter. She realizes that she must overcome the Many Arms of Death or the fight will continue and their children and their children’s children will grow up fighting the same battle that they are. 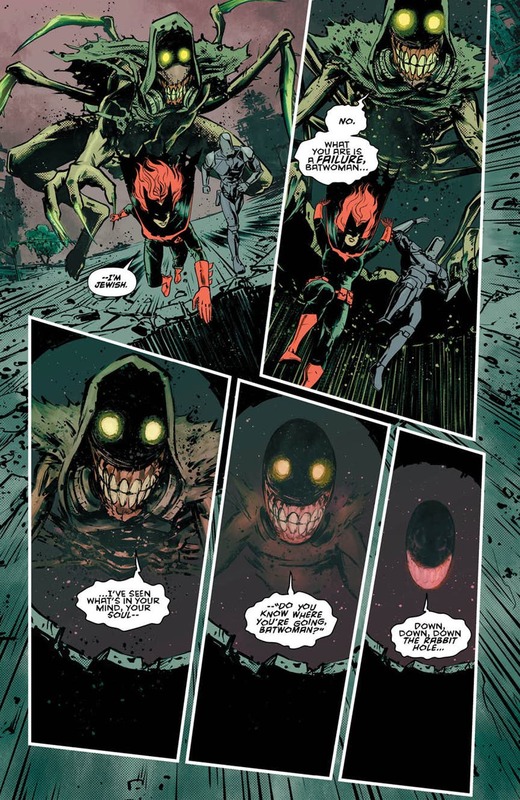 This gives Kate the strength to overcome the hallucination and instead of Scarecrow having the upper hand, Kate transforms herself in the hallucination into a giant beastlike bat. This is where the issue leaves us. 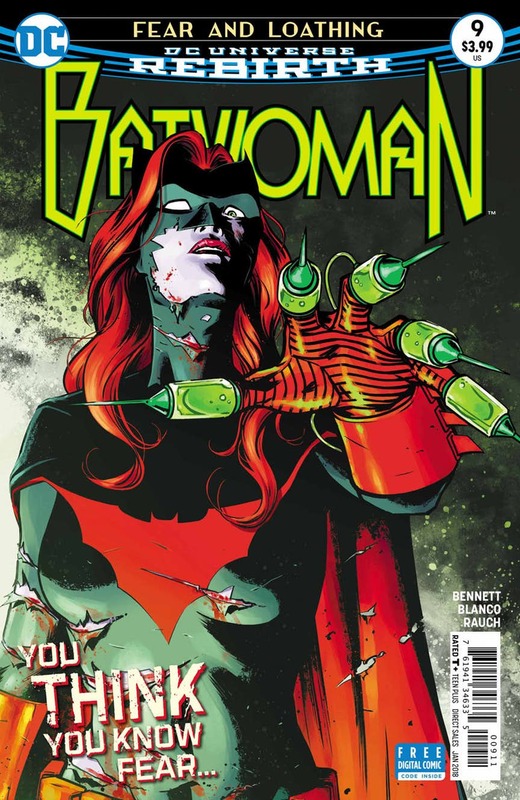 Unfortunately, despite my enjoyment of the last issue, this issue returns to form as Batwoman once again is filled with nonsense and poor storytelling. Some of the art is very well done, especially during the fight sequences but overall, this story is just lacking quite a bit. The art, while good, fails to properly relay certain actions so it makes the reader confused with Kate suddenly has a bomb of some sort. In addition, a majority of the issue is Kate and Colony Prime arguing about daddy issues. Moments like these can be used for character development but this is information that we as readers already know and have already been through. Nothing changed because they argued. They just argued for the sake of argument. Also, I hope readers remember that Rafael fixed Kate’s head with gold otherwise that is going to come out of left field for a lot of readers. (Not to mention that Kate hasn’t been doing that so why would she do it now?) Overall, this is just a mess once again and I can’t believe I let myself fall for the last issue. I let myself hope and it kicked me in the nuts once again. 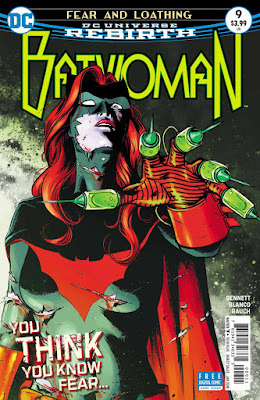 Batwoman #9 continues an already taxing story that most readers will most likely be fed up of at this point. Not only have we continued the Many Arms of Death storyline but we also revisit Kate’s relationship with Colony Prime and spend most of the issue dealing with an argument that they have debatably had several times before. Nothing really changes in this issue and so far it has played out exactly as expected and that’s not a good thing. Man, once again I have to completely disagree with you. I thought this was the best issue of this run so far, and by a lot, for pretty much all the reasons you gave as negatives. It's great stuff.